What does a typical day look like for you? “Well, no two days are alike,” is a common response to the question that marketers get on a regular basis. 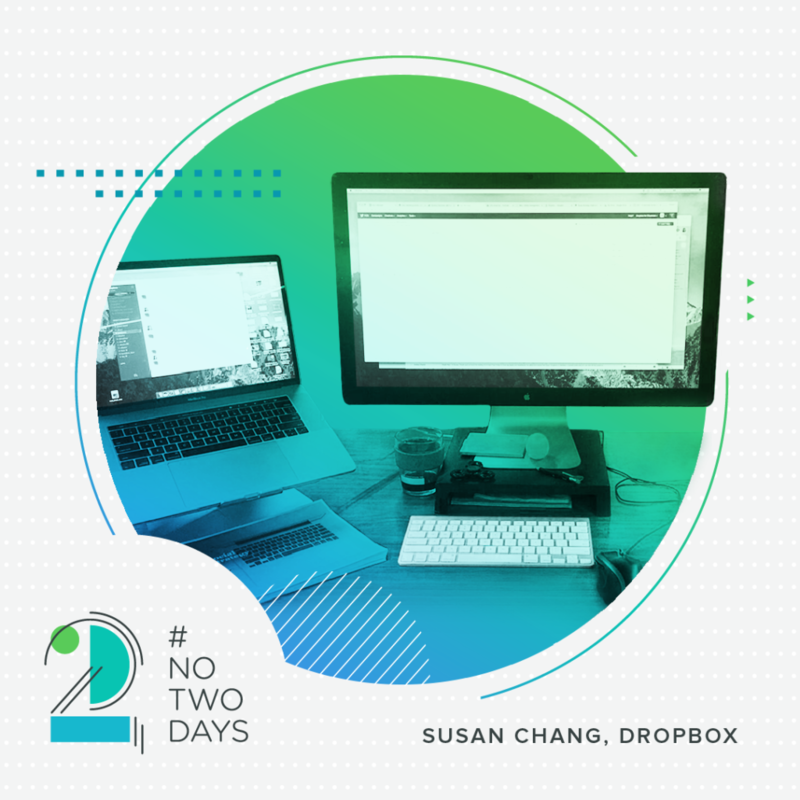 In the third installment of our new series, #NoTwoDays, we examine the day of fellow marketer Susan Chang, social media manager at Dropbox, to provide a glimpse into how she starts her mornings, manages marketing meetings and makes time for creative collaboration. 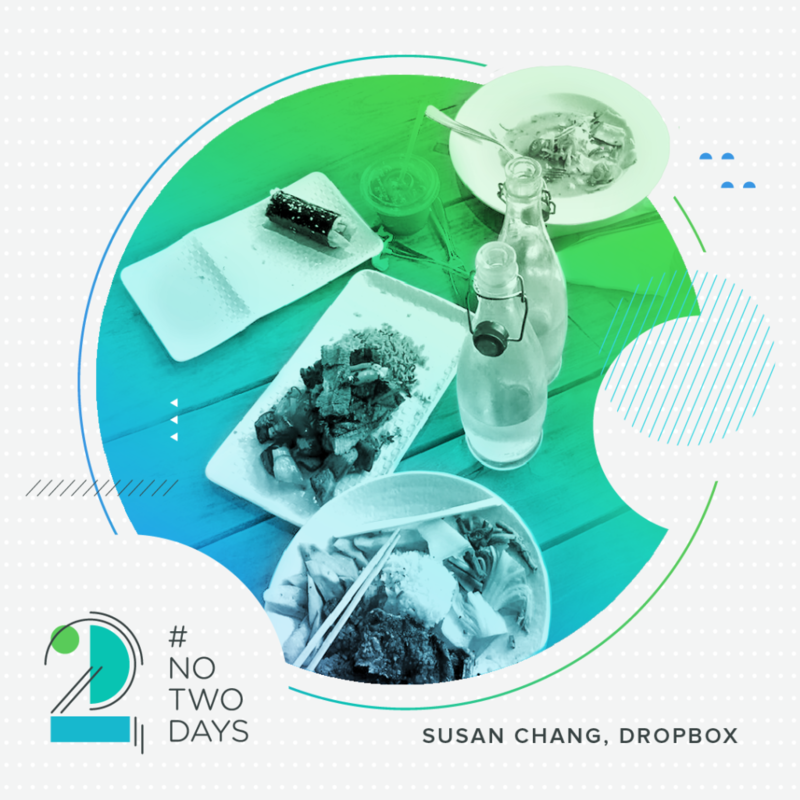 Because no two days are ever the same, here’s a (edited for clarity) day in the life of Susan—let’s dive in! 7 a.m.: Good morning! The first thing I do is open Twitter on my phone to check what happened on the Bachelorette finale. I do a quick scan and see that the Twitterverse, as expected, is up in arms over Rachel’s final decision. I make a mental note to fully investigate this later. 8:30 a.m.: I hop on the San Francisco Muni to head to work. I settle in and take out my Kindle—I just started reading Ready Player One. Admittedly, it’s not a book I would have picked for myself (it’s for a book club and I’m not into video games), but author Ernest Cline does a memorable job of vividly describing a new world of the not-so-distant future in a very relatable way. 9:13 a.m.: Just arrived at the office and off to grab coffee at our cafe, little-r! Before jumping into the work day, I catch up on emails. 9:45 a.m.: Breakfast time! Eggs, veggies and orange juice from the Tuck Shop (our cafeteria) is my breakfast of choice; “tuck shop” is a UK term that means “small shop that sells food” (our exec chef grew up in England). 10 a.m.: My first meeting of the day is a sync with our social team’s Twitter account manager. 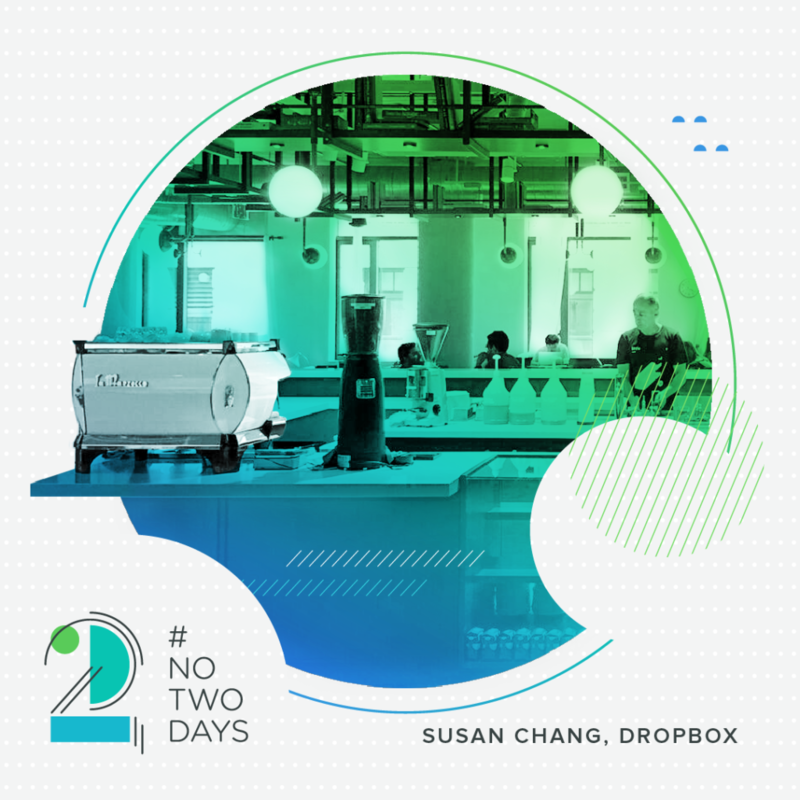 I give her an overview of our Q3 social campaign plans and she signs our @Dropbox and @DropboxBusiness handles up for a program around ad frequency. The social ad landscape is changing so fast and it’s important for our team to learn first about new ad types so we can start experimenting and measuring results. 11:03 a.m.: Our office floor plan is really open and there are lots of comfy, living room-like corners set up for potential group collaboration opportunities. One of my colleagues on the marketing team calls an impromptu check-in with the social and content teams on the couch near our marketing pod. We let her know what’s top of mind for us—for me—flagging that we’ll need to consider creating a voice/style guide that speaks to a business audience. 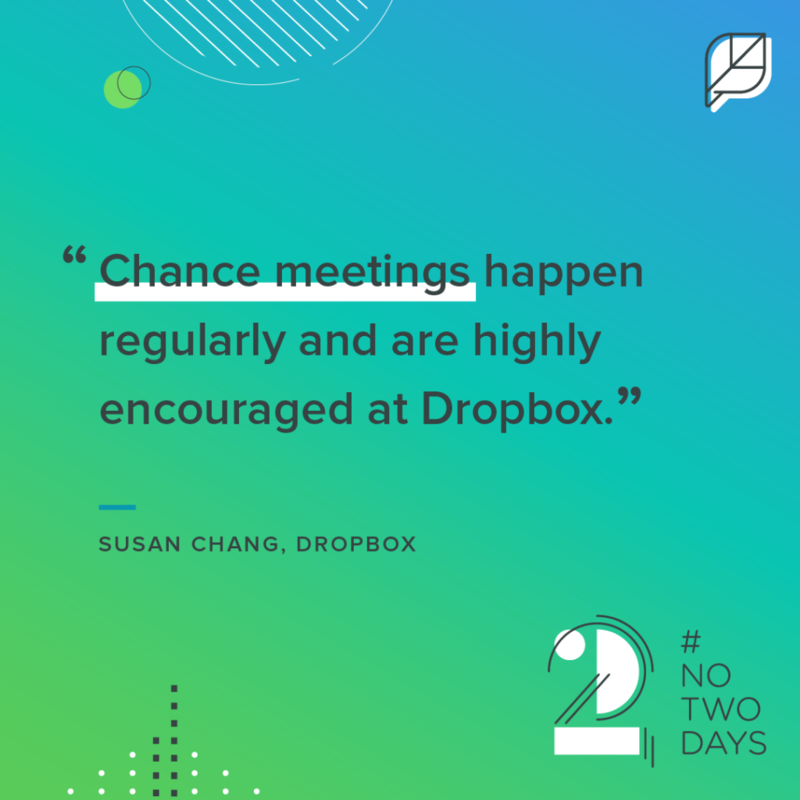 Chance meetings happen regularly and are highly encouraged at Dropbox. It’s a great way to get input really quickly from multiple perspectives and our communal office spaces really facilitate this type of collaboration. 12 p.m.: Grabbed lunch with some folks from the marketing team. We’re really lucky to have amazing food options at Dropbox. I went for the kalbi rice plate today. 12:30 p.m.: Second lunch 😝 . It’s a thing. Pulling together social results for a business campaign I launched two weeks ago. 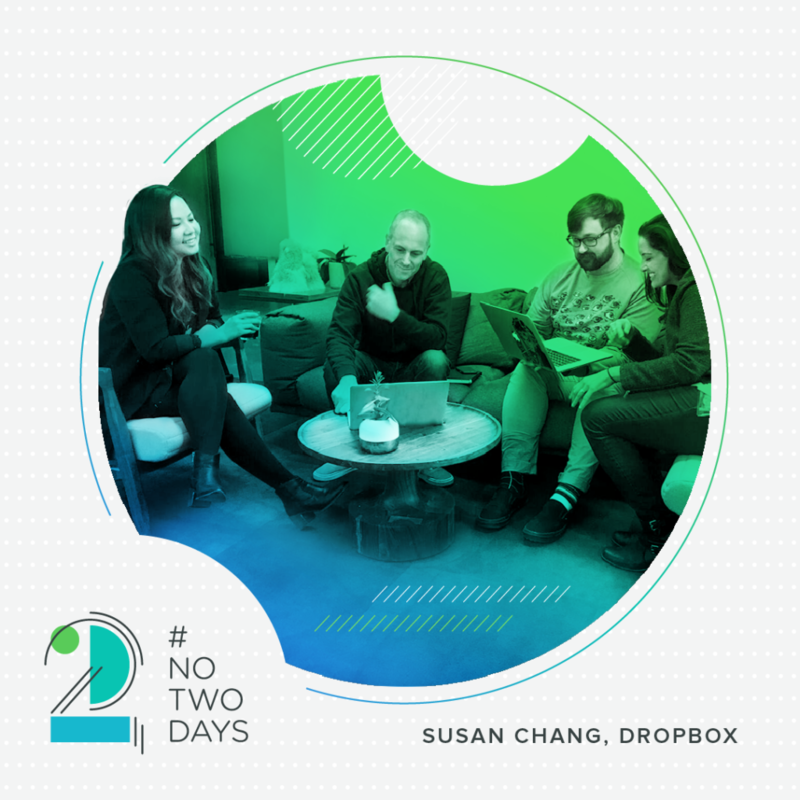 Launching a video views ad campaign on Twitter and Facebook so more people can learn about how marketing teams use Dropbox. Updating the social strategy for an upcoming launch. I spend some time thinking about how to best target and group audiences so social spend is most efficient. Managing the Q3 social budget and making sure enough spend is allocated to future campaigns. Approving two upcoming blog posts for the Dropbox Business blog. Finalizing a presentation I’ll be giving at a social strategy workshop tomorrow with our content marketing team. Making intros for our analytics team so they can get to know our account reps at Facebook, Twitter and LinkedIn and dive into data tracking. 6:30 p.m.: Time to head home! 8:30 p.m.: Meet a friend for dinner. It was a cool and windy 60 degrees in San Francisco tonight so Shabu Shabu felt like the right decision.